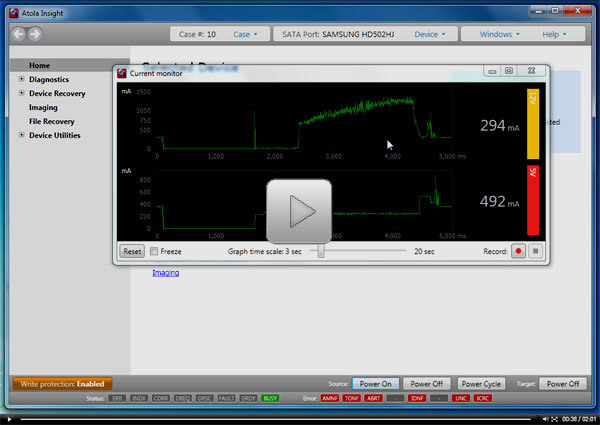 Accurately assessing the state of a hard drive and the exact points of damage will determine the approach taken to successfully complete the recovery or data acquisition. We cannot stress enough how important the initial diagnosis is. Imagine doctors sending patients for a surgery without any kind of initial diagnosis. Many would call this a crime, and yet, the initial assessment is still largely overlooked in most data recovery and forensic operations. As the result, many data recovery or acquisition jobs fail simply because this crucial part was not done properly. 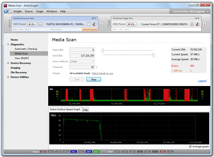 Atola Insight solves the issue once and for all by providing the in-depth diagnosis engine that functions fully automatically, with a single click – literally! 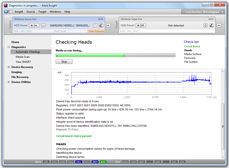 In fact, since its first release back in 2008, the Atola Insight is the only product on the data recovery and forensic markets that examines hard drives at the deepest possible level. 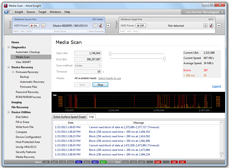 The Atola Insight is able to accurately diagnose hard drives that cannot be recognized or identified by any system including the vast majority of disk duplication, data recovery, and data acquisition products, even the most sophisticated ones. In cases where the Atola Insight cannot recognize the hard drive, it can still diagnose the drive by sensing the SATA PHY status, sending low-level, vendor-specific commands into the HDD, and interpreting electrical currents. Here's how this works: Atola Insight applies power to the hard drive and immediately starts measuring its startup currents. Then, comparing the startup currents to the internal database it can detect a specific failure. 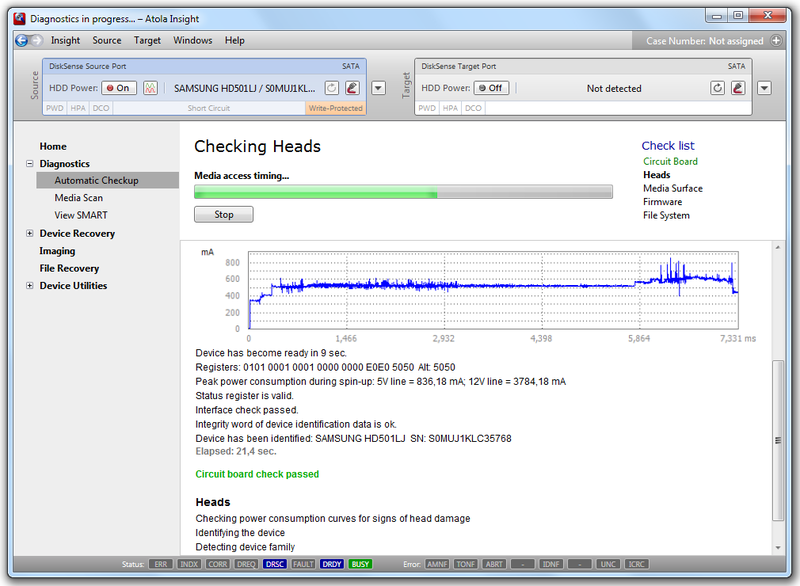 The Atola Insight's automatic diagnostic function evaluates the state of the hard drive, identifies specific errors and then recommends steps for moving forward with HDD recovery and data extraction. This is the starting point for all data recovery or acquisition cases. The operator simply plugs the damaged hard drive into the DiskSense unit and clicks a single button to start the automatic checkup. Real-time status updates are displayed throughout the diagnosis and a full diagnostic report is then generated in less than 5 minutes. 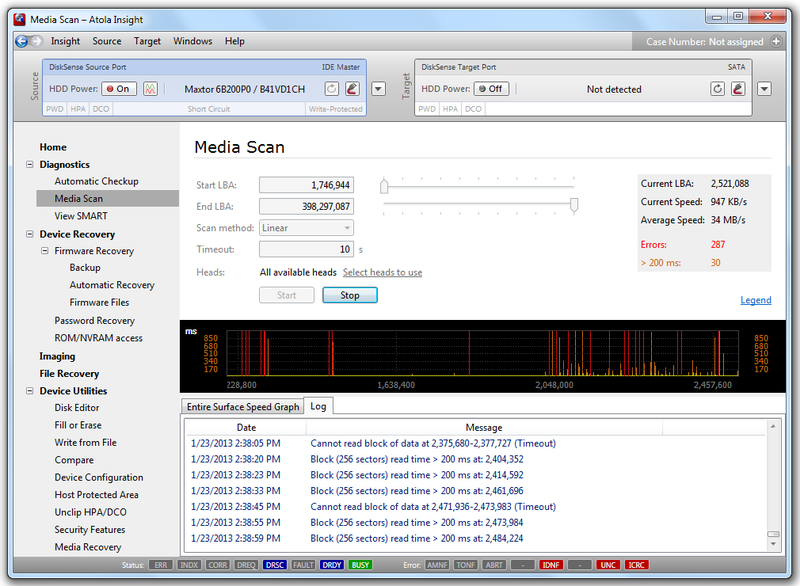 The Media Scan #1 screenshot shows a cluster of sectors with longer read time (slower speed). 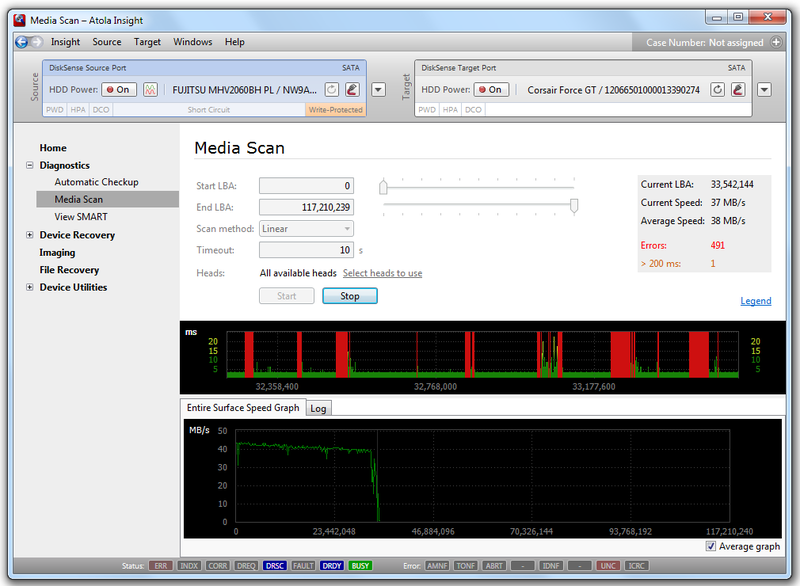 This indicates that the sectors were read successfully, however, the hard drive may have made several re-reads and ECC corrections, which may indicate media degradation or weak writes.